The Ross Glendinning Medallist is Lachie Neale who was judged best on ground by all three judges. 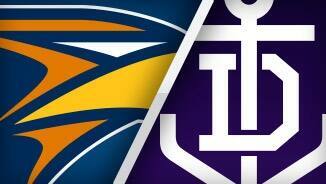 FULL TIMEThe Dockers win Derby 39 and balance the ledger a little more, currently the Eagles hold sway 21 wins to 18. BEHIND EAGLESCripps with a hurried snap on goal sends it wide for another point to the West Coast...he has had plenty of shots today, he just needs to work on his finishing. GOAL EAGLESRosa and Mayne fly, rosa taps it over his head to his advantage and then recovers to run onto the ball and goal...good play from the Eagles' forward. Ballantyne and the coach were both unimpressed with Crozier's decision. BEHIND DOCKERSThe Dockers run the ball forward, Crozier carries it through 50 and then ignoring Ballantyne closer to goal, bounces the ball - fumbles and then has to hurry his kick for a point. GOAL EAGLESDarling runs his opponent under the ball and juggles a mark. He has tried valiantly all day and gets reward for his effort as he kicks another goal. In game number 200, Sandilands plucks down another mark on the wing, the big man has had a good game today against the twin towers of Cox and Naitanui. Kennedy marks outside 50 and looking downfield sees an open goal square, he decides to go for the long bomb and try and roll it through, he loads up and...kicks into the man on the mark. Sandilands takes two marks deep in defence one off a shot from Kennedy and the other as he waded through a pack in the goal square, Freo look to have found some form. Schuey is back on but he is moving at half pace, if the Eagles go down today that is four losses in a row. 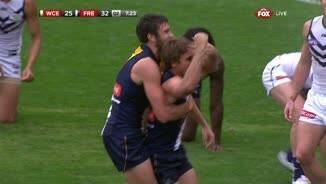 GOAL DOCKERSNeale converts the set shot and the Dockers go to a 31 point lead...West Coast look spent. Suban dives onto the ball and fires a quick hand pass out to Neale who is immediately shoved into the turf...free kick Fremantle. A kick into the Dockers' attacking 50 is delivered into space for Pavlich to run onto, however he doesn't make it and Glass marks unopposed. Bennell leaps high over Pavlich to thump the ball clear, he was up over Pav's shoulder on that occasion. Cripps is back on and moving alright, Schuey is having his ankle restrapped, however both sides are really feeling the pinch from the electric tempo of this match. Once again Kennedy is bustled out of what he should have taken...McPharlin is having a great game despite an early injury scare. Cripps went down into the room early in the term for some treatment and now Shuey is off with a rolled ankle the Eagles have used their Sub and could be down two men. Eagles InterchangeLuke Shuey off due to an injury. GOAL DOCKERSZac Clarke is late on the scene, however as the second man up in the marking contest he makes it his own and pulls down a big one...he confidently converts the set shot. Schofield the West Coast Sub, grabs the ball in the middle of the ground and drives it long, however Kennedy is easily outpointed by clever body work from McPharlin. 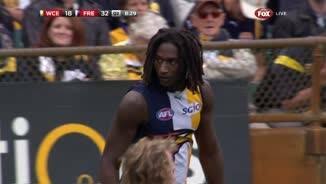 Naitanui wins the first hit out but it is roved by the Dockers who swing straight into attack. FINAL QUARTERSuban came on and had a big third term, he had a hand in three goals and could be the difference in the final term. THREE QUARTER TIMEThe dockers found some touch in that quarter, despite going behind for the first time in the match they regained the lead. Once again the Eagles inaccuracy proved costly. GOAL DOCKERSFrom the turn over the Dockers charge forward and Ballantyne marks just inside 50, he converts the kick and the dockers lead by 19 points. Mackenzie, looks tired, he is aline in space and drops a mark, he recovers but rushes the kick and in turn sees it turned over down field. SUBSTITUTIONLycett is off and dons the Red Vest as Schofield comes into the game. Both sides are looking weary from the frenetic pace of this game, fresh legs could mean all the difference. BEHIND EAGLESTunbridge from wide on the far flank has a long shot on goal, his kick is wide and the Eagles close the gap one point at a time. BEHIND EAGLESRosa has a snap across his body just inside the arc...the ball goes just the wrong side of the post for yet another behind to the West Coast. The Dockers looked like they were out of defence when a kick to Suban was intercepted by Nic Nat who thumped the ball clear. GOAL DOCKERSThe Dockers are steadying as they start to rack up the possessions, a long chain of hand ball sees the ball delivered to Zac Clarke off the boot of Suban...Clarke goals. BEHIND DOCKERSPearce is gifted the ball 20 out and declines to make the Eagles' pay as he sprays his snap wide...poor kicking at goal is really the story of the day for both teams. GOAL DOCKERSMundy drops a kick into Crowley's lap as he marks in space 20 out, he will go back and take the set shot...his kick is stabbed through the middle for a goal. BEHIND DOCKERSFyfe with a mark 40 out...he too cannot convert as his kick goes behind. Cripps is off and in the hands of the the trainers after finding himself at the bottom of the pack and coming off the worse. GOAL DOCKERSSuban in heavy traffic bashes his way through, finally he slings a hand pass out to Fyfe who is in space he runs towards goal steps around the defence and tumbles through a kick. Dockers InterchangeLuke McPharlin off due to an injury. Welcome to Patersons Stadium for the West Coast Eagles v Fremantle Round 7 clash. The Dockers lost defender Zac Dawson to an ankle injury during the second quarter and trailed by six points early in the third term at Patersons Stadium. But last year's grand finalists dug deep when it mattered most, booting the next six goals to secure the 11.7 (73) to 7.12 (54) win in front of a 40,476-strong pro-Eagles crowd. "It was a gallant victory. 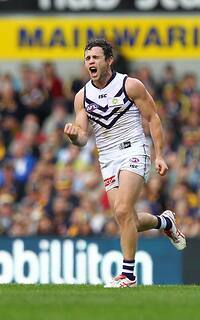 We worked hard to bank the four points," Dockers coach Ross Lyon said. "We came in undersized which we knew but we were happy with that, then the worst possible result - tall defenders (get hurt)." West Coast only had itself to blame for the loss after spraying a number of gettable shots on goal when the game was on the line. The Eagles have kicked a combined 23.39 in recent losses to Geelong, Port Adelaide and Carlton. And they booted 1.8 during the second quarter against the Dockers at a time when they could have set up a handy lead and crushed Fremantle's spirit. 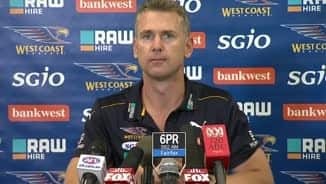 "Third week in a row we've had more scoring shots although I think clearly the momentum was with Fremantle for most of the day," Eagles coach Adam Simpson said. "We did have our chances in the second quarter and when we do have momentum at the moment we're not capitalising and other teams are." The result stretched West Coast's losing run to four, while Fremantle improved its record to 4-3 ahead of tough matches against Port Adelaide (away) and Geelong. Dockers midfielder Lachie Neale won the Ross Glendinning Medal as best afield after tallying 32 possessions and one goal, while Nat Fyfe, Michael Johnson, Paul Duffield, Danyle Pearce and Hayden Ballantyne were also crucial in the win. Aaron Sandilands (20 possessions, 38 hit-outs) stood tall in his 200th match, beating Dean Cox and Nic Naitanui to take the ruck honours. Fremantle forward Chris Mayne was forced to play most of the second half as a defender after Dawson was subbed off with his ankle injury. West Coast midfielder Luke Shuey twisted his right ankle while being tackled by Ryan Crowley in the final quarter. It was a miracle West Coast didn't trail by more than 14 points at quarter-time. 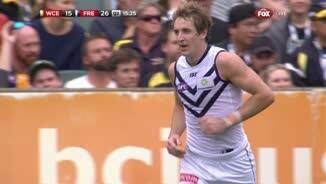 Fremantle doubled the Eagles' possession count and won the inside-50 count 17-3. But opportunistic goals to Josh Kennedy and Jamie Cripps limited the damage, with the Dockers left to rue a host of missed chances. They were also left sweating on the fitness of key defender Luke McPharlin, who limped off in the early minutes with an upper leg injury but managed to return later in the quarter. The second quarter was in complete contrast to the first, with West Coast dominating proceedings. The Eagles had nine scoring shots from 11 inside-50s. But a return of 1.8 let the Dockers off the hook. 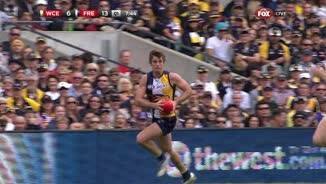 Fyfe ran riot in the opening quarter with 13 possessions, but he failed to gather a disposal in the second term as Selwood wore him like a glove.